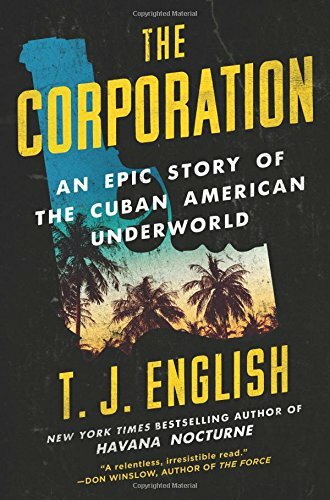 T. J. English’s newest look at the American criminal underworld, The Corporation: An Epic Story of the Cuban Underworld, has a unique genesis. It started as a film treatment but the producers felt that their proposed movie needed the gravitas of a nonfiction book to bolster the cinematic drama. They approached English, whose work in the genre of organized crime books includes such well-received titles as The Savage City and The Westies. Given a mountain of material by his Hollywood contacts, followed up with his own meticulous research and new interviews, the resulting book is a wild and wonderful follow-up to English’s previous book Havana Nocturne: How the Mob Owned Cuba and Then Lost It to the Revolution. José Miguel Battle was just another corrupt Havana cop when his world came apart after Fidel Castro’s Communist revolutionaries brought down the Batista regime. Battle fled north to the United States, where he volunteered his services in what would become the doomed Bay of Pigs mission. Embittered by these losses, Battle turned to more lucrative opportunities found in bolita, the Cuban-American version of the numbers racket. Like many an American gangster, Battle turned a small-time operation into a money-making machine. He partnered with his peers in the Mafia, opening bolita parlors in Florida, New Jersey, and New York. Within a few years Battle was a major kingpin, known throughout the underworld as El Padrino, The Godfather. He bought a farm outside of Miami, filled with groves of mamey, a native Cuban fruit. Battle also had a soft spot for stray dogs, turning his farm into something of a rescue shelter for homeless canines. To neighbors, Battle had all the appearances of a happy gentleman farmer. Beneath the veneer was something else entirely. El Padrino’s business was nicknamed “The Corporation,” and it thrived on ruthlessness. Battle’s world was filled with destruction of enemies through a coldblooded repertoire of gunfire, arson, bombings, and other blasts of violence, fueled by Battle’s gargantuan ego and oversized appetite for cocaine and young women. Victims included competitors, Corporation turncoats, and the collateral damage of anyone with the unfortunate luck to be caught between Battle’s operation and intended targets. These fatalities included children. This mattered not to El Padrino and his underlings. Battle wasn’t satisfied with being an American crime boss: his real dream was to operate a casino. He opened the Casino Crillón, a gambling paradise in the heart of Lima, Peru. While he was well equipped to lord over a vast chain of storefront bolita parlors, Battle didn’t have the business acumen it took to run a full-scale gambling center. Casino Crillón was a money-losing operation from the start and not just because of the expected skimming of profits. Battle maintained a headquarters in the hotel where he regularly indulged in his steady cocaine habit, maintained his mistresses—women young enough to be his granddaughters—and kept all three Godfather movies in steady rotation on the television. He fancied himself another Don Corleone, but in the end Battle was just another brutal gang overlord and cocaine dealer who was done in by his own excesses. Heroes abound throughout the story, most notably Miami cop David Shanks. A mirror opposite of Battle’s days as a corrupt Cuban police officer, Shanks rose through the ranks from street duty to narcotics detective. Bringing down Battle became more than just a job for Shanks: it turned into an all-consuming quest, one that cost him dearly in terms of both career and personal life. Shanks’s devotion to the case sucked up every waking moment, even at the expense of his marriage. The FBI and police officials in Peru were others determined to end El Padrino’s empire, but none with the single-minded, often grueling dedication that Shanks threw into his years’-long quest. English has a sprawling story to tell, panoramic in scope and stuffed to the gills with characters ranging from the psychotic to the heroic. The formidable research that went into The Corporation takes off through the author’s engaging prose style. The book zips along at a steady clip within its 522 pages. If anything, English drills down into too much minute detail with each new revelation. Scenes pile up one after another, with occasional moments where the terrain becomes confusing. An annotated list of characters at the beginning of the book would have been helpful rather than a chart buried after the acknowledgments at the end of the book laying out the players and roles of Battle’s racketeering enterprise. That’s a minor point within an otherwise incredible true tale. Gangster films from the days of Little Cesar to The Godfather trilogy to Martin Scorsese’s oeuvre have provided a certain mythology to the American image of organized crime. With The Corporation English does something else: He gives readers the profane realities of this dirty business in all of its horrific forms.